I tried to find some good information about Remarkable Cave online, as the bits of info from brochures and signs is fairly sketchy. Having failed to find much, I read my books. There I found some good info. I'll put this up for now, but I need to read more, get some better pictures, now I know what I'm looking for, and also get inside the cave. Most of the solid information I have found about Remarkable Cave comes from the work of David Leaman. 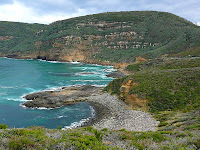 This comes from his books The Rock Which Makes Tasmania (Review here) and Walk Into History In Southern Tasmania. The cave was originally called “Remarkable” because of the way there appeared to be a map of Tasmania if you stood inside and looked through the cave at the right angle. You can see this clearly as you stand on the viewing platform. Now, to make the cave more interesting, it has two entrances from the sea-end. Two separate caves have joined up. I recall walking through the cave many years ago. I think at that time access to the floor of the cave was less restricted. The viewing platform these days tends to discourage venturing further. I didn’t clamber down, as the sea was washing into the cave rear, and there was little point. However, when you can walk through the cave it is very interesting. I’m trying to find photos from all those years ago. David Leaman’s view is that the cave is quite unremarkable (“run-of-the-mill”). He’s speaking as a geologist. His view is that the intrusion of the dolerite, the rocks it intruded, and the effects that intrusion has, is what makes the area remarkable. I suppose most tourists would disagree, but the rocks are very interesting. They can be seen clearly from a number of vantage points. 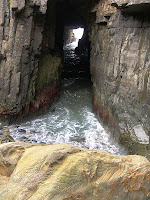 I think there is also much to be seen inside the cave, so I’m keen to return when the tide is low enough. Most of the rocks here are Triassic sandstones. These were intruded by Jurassic dolerite. The intrusion can be seen clearly around Remarkable Cave. 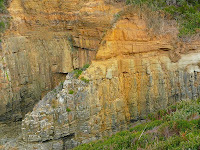 The top of the intrusion and its contact with the sandstone can be seen in the cliffs and shore platforms around the area. The question is whether the folding occurred at the time of the intrusion, or when the rock was laid down. There is no firm answer. A previous doctoral thesis (Powell, 1967 - Studies in the geometry of folding and its mechanical interpretation) had suggested that the folding was caused by the heating of the rock with hot liquids and gasses related to the intrusion. Leaman thinks this is unlikely, and that the sandstones were folded soon after they were deposited, when they were poorly compacted. 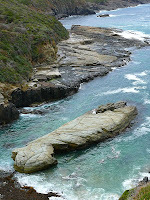 They were then overlaid by more sandstones, and then later intruded by the dolerite. The dolerite intrusion has altered (metamorphosed) the sandstone by heat. 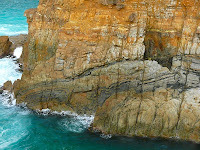 Leaman notes that the distorted sandstones are also intruded and cut by the dolerite suggesting that the folding existed before the intrusion of the dolerite. Some good info there, thanks! Your photos look great too with the sun on the rocks. It was rather dull when I was there in July. I love looking at such rocks, with their intrusions and foldings, etc. I find it all mind-blowing. Great work. Really nice images too. Thanks Denis and Mosura, I had a good day there, and the sun was out a fair bit of the time at least. Beautiful area, and lots of future exploratory opportunities. I'm hoping that whatever happens with the proposed 3-Capes Walk (and some dissent here) doesn't cause any access difficulties for day walking or walk plans that aren't quite in tune with their programmed walk. In addition, I think their overnight stops for walkers are quite over the top.